Have you ever given a gift to a child only to have them toss it aside and ask for something else or, even worse, burst into tears? Have you asked your young child to pick out a gift for someone else and they are only willing to select an item that they themselves would like to receive? (I am guessing that Dad will not be thrilled to receive a pair of size 3 Dora socks.) If these experiences resonate with you then the good news is that your toddler is right on his or her developmental track. The bad news is that all parents do need offer some gifting lessons to their children to enable a happy gifting experience for all. Young children are mostly egocentric with bursts of sweetness here and there. Expect that your child will not always be able to play by Emily Post’s rule book for social gifting. Holidays and birthdays are overwhelming for young children. They are typically off their regular schedules and are receiving excess treats, parties and presents for up to a month prior to the big day. As exciting as holidays and birthday can be, they can also be stressful for a young child (and parents). Stress can diminish a child’s ability to have a proper perspective (i.e. be appreciative and sensitive to other’s feelings). The parts of a young child’s brain that allows them to understand other’s thoughts and emotions are still under construction. Just because your child was able to thank his teacher for the candy that she gave him, doesn’t mean it will occur to him to thank Grandma for his new race car. The ability to utilize empathy and thereby demonstrate gratitude, thoughtfulness and generosity is very inconsistent and in the early years (i.e. infants) barely present. It takes time for a child to understand another’s experiences in selecting and giving a gift so that he can appreciate the gift as well as how how to give a gift. Giving: Foster generosity and empathy at home through gift giving, but don’t over do it. Offer your child the opportunity to spontaneously offer/create a gift for other people, but do not force them to give. Pick a couple of people in your family to give gifts to and follow your child’s lead for ideas. Also, do not buy expensive gifts for your child to give to their other parent, grandparent, etc… This will give your child the impression that they don’t have what it takes to offer a likable gift. A great gift is one that has thought behind it. 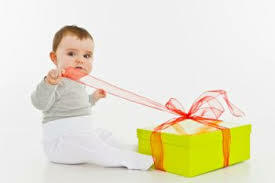 For whichever gift your child selects or creates, ask them to state a reason why the recipient will like the gift. Let your child give gifts that are odd and even self-centered if that is what they choose. Follow-up the gifting experience with asking them how the other person felt when their present was opened. Your child will learn to consider others with time. Receiving: A young child can mostly process up to 3-5 gifts at time. After about 5 gifts, they tend to demonstrate signs of over-stimulation. If you want your tot to appreciate his or her gifts, then give fewer presents. Keep in mind that repeat gift giving over a short period of time can condition a child to expect the receipt of gifts (candy, other treats and fun activities are included). If you have too many gifts for a big celebration, it is OK to hide a portion of the gifts and pull them out occasionally over then next couple of months. Being thankful can be difficult at times, but thankfulness is an important part of gifting. During the first stages of life, saying “please” and “thank you” is a rote skill and based more in a cause and effect mentality than one of gratitude. (When I say “thank you” everyone one smiles, yeah for me!). You can teach an infant to sign “thank you”, but hints of true gratitude do not emerge until later in life. Do not force your young child to sign thank you cards as they likely will not connect their drawing of a picture to their receipt of a present. Thank you cards are a bit abstract for a young child, but a call to grandma, a in person verbal “thank you” or a big hug for Dad is always a good choice. If thank you cards are a must for your families gifting culture, then mention each gift as your child draws his picture or signs his name on each card and remind them that they are doing this to say “thank you”. Most importantly, wait until the child is ready and willing to offer his or her genuine thanks. If a child refuses to thank someone for a gift, remove the gift and tell them that they are “not ready” to receive the gift until they say “thank you”. Gifting is a learned skill. If you want your child to successful offer a thoughtful gift or receive one with gratitude, then don’t wait until the big moment to teach your child the art of gifting. You can practice gifting at home through playing pretend (i.e. role play), reading books on gift giving and receiving (we love “Berenstain Bears Joy of Giving”), visiting a store together (when you have nothing else to shop for) to talk about how to select a present, modeling appropriate gifting behavior, narrating the gift giving and/or receiving experience and offering specific and judgement-free feedback on your child’s gifting. The more practice your child receives in the art of gifting, the more enjoyable your family holidays and celebrations will be for you and your child.